How different are lumpfish from different origins? New publication from SMARTAQUA team suggests that some lumpfish populations are very small and have low genetic diversity, which makes them particularly vulnerable to over-exploitation and genetic introgression. The results, published this week, as Genetic and phenotypic differentiation of lumpfish (Cyclopterus lumpus) across the North Atlantic: implications for conservation and aquaculture, show that there are five genetically distinct groups of the species. These are located in the West Atlantic (USA and Canada), Mid Atlantic (Iceland), East Atlantic (Faroe Islands, Ireland, Scotland, Norway and Denmark), English Channel (England) and Baltic Sea (Sweden). 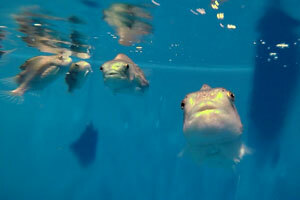 Would you like to learn more about cleaner fish and the role of lumpfish in salmon farms?